Angola’s most impressive natural resource is the Mayombe rainforest in the Northern Cabinda Province. The forest covers and average of 290.000 hectares. Mayombe is often described as the “Amazon of Africa”, hosting a remarkable variety of plant and animal species. Wildlife in Mayombe reserve includes mountain elephants or forest elephants (Loxodonta cyclotis), gorilla, chimpanzee, crocodile, monkey, parrots and butterflies. However Mayombe is not just an amazing forest for animals, but also an enormous supplier of tropical hardwoods. There are many precious woods in the area, including ebony and rare variety of mahogany. 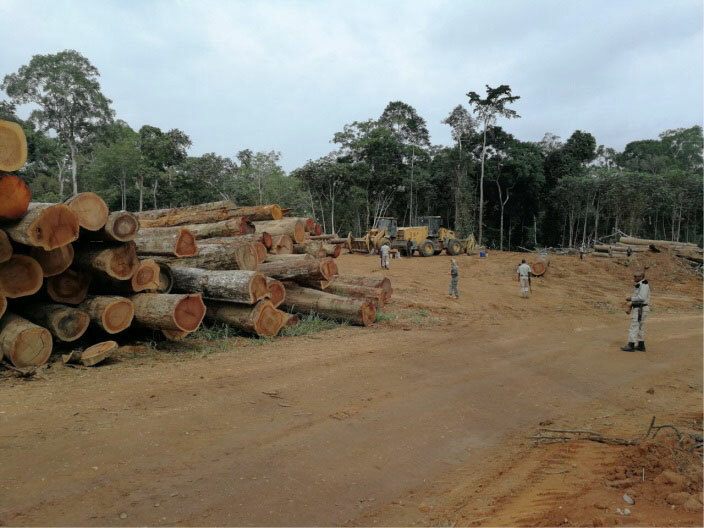 According to estimates, the forest supplies around 150.000 cubic meters of timber a year for the construction industry and export activity. Over the last year, with China being present more than ever in the region, and the illegal clearing of forest by various groups, the forest sees a high risk of deterioration. Located in the North between the village of Inhuca (Buco Zau Municipality) and the village of Miconje (Belize Municipality), Mayombe occupies most of the Northeastern Cabinda. 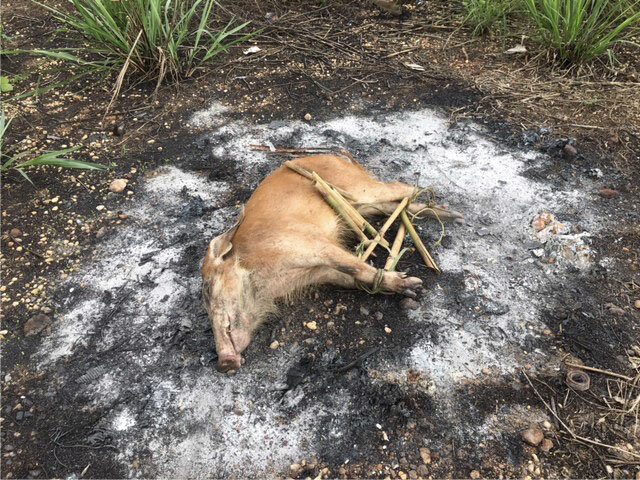 The Forest Park Reserve was set up primarily to protect the wildlife population and flora, but the work done within the Reserve is not enough to make this happen, as poaching and bush meat industry seems to be notorious. Mayombe is a National Park and animals are protected under CITIES rules and agreements. The main species living in in the area are mountain elephants, Western Lowland Gorilla, Chimpanzee and gray parrot. There is a plan to protect and conserve the forest, but no further movement has been done so far. The plan is lacking decision making process and finances, as four countries are involved. Furthermore, there are absolutely no demographics on the fauna of the forest. It is even not possible to give estimation on the different population habiting the area. Overall Mayombe is not in many of the plans nor has any solid tangible budget put aside for conservation. African Amazon consists literally of a virgin land inhabiting wild species as well as notorious poachers. There have been no finances for conservation put aside for it. Cabinda has 14 rangers with very limited means, whom are extremely insufficient for that total area.  Wild@Life was there to see what can be done to preserve Mayombe. 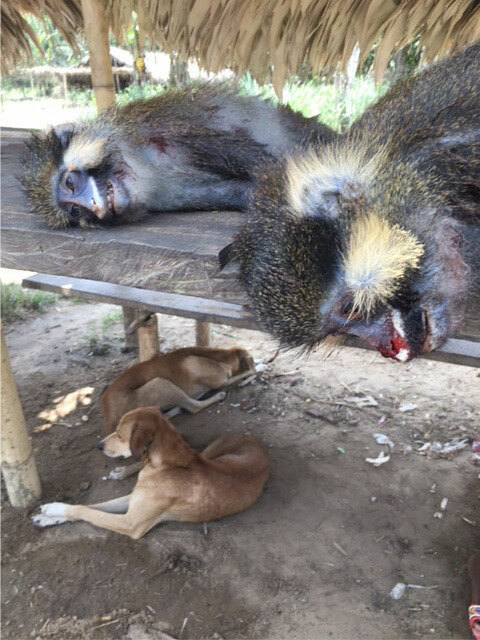 On our way to Buco Zau with Park Rangers, the Province capital, we have seen primates sold on the roadsides as bush-meat and have stopped to document it. This is one of the biggest concerns of the species extinction. Environment education needs to be provided, as well as alternative jobs, for these people to stop this trade. The Rangers are missing a considerable amount of technological and basic needs. Wild@Life patrolled Mayombe Region. We have confiscated poached animals, and poachers have been brought in for questioning. We then burned the confiscated animal in order to set example. 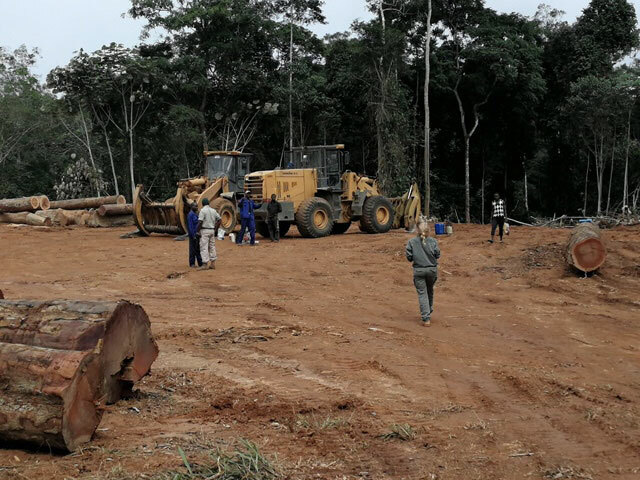 Our team entered the forest and saw some illegal timber cutting on a Sunday and we have documented the evidence. 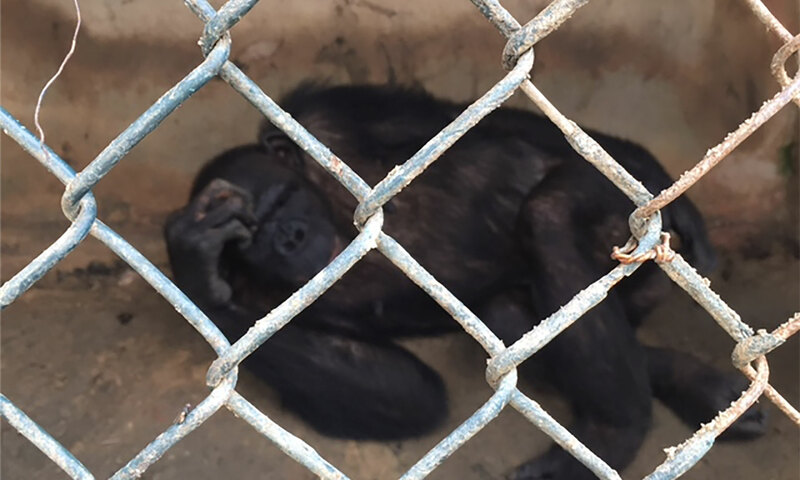 In Cabinda, we have found 2 chimpanzees kept in small chicken cages. 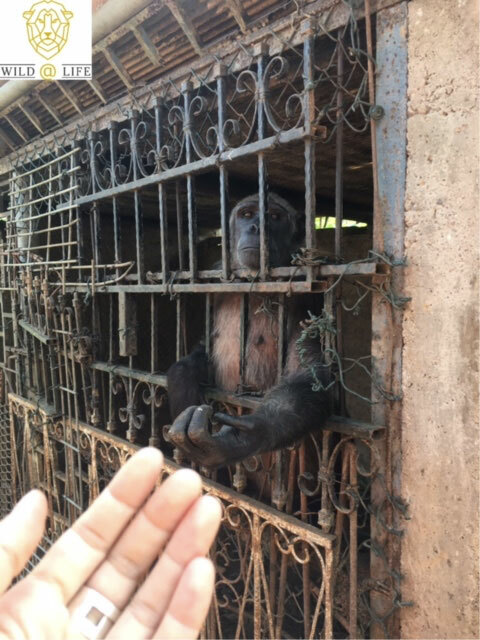 Once rescued from poachers, these two spent their entire lives in separate small cages. A plan needs to be done to save Joana, 21 and Riquita, 16, from this miserable condition. 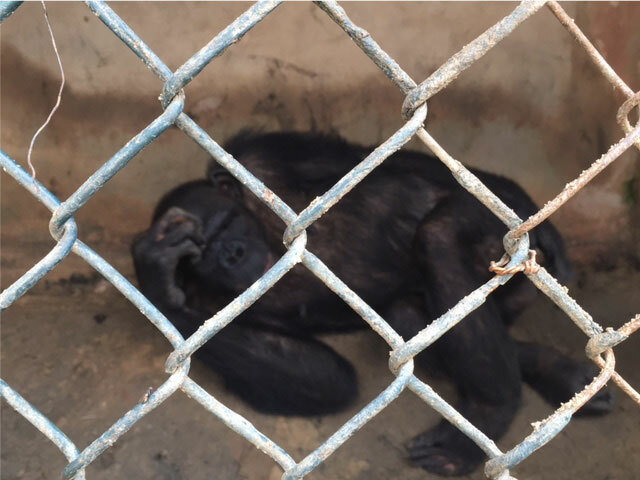 Cabinda is home to more animals like this, and a plan would be needed to lift these animals to better living conditions. 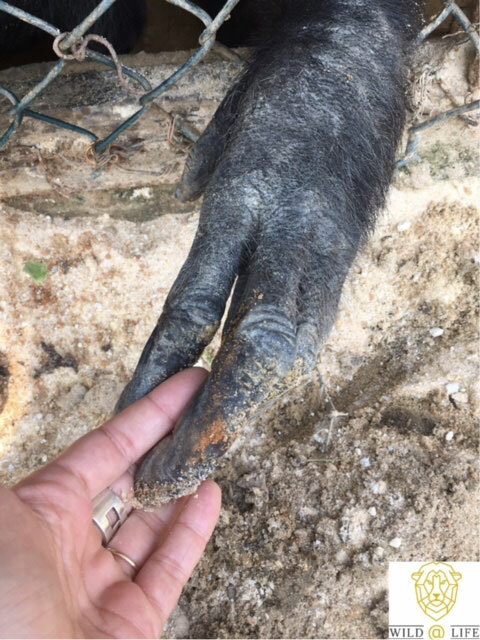 Wild@Life will undertake this and we will make sure to built the first sanctuary of the area and bring these girls freedom. We need to open an orphanage/sanctuary/ rehabilitation center in Mayombe. An ideal sanctuary cost is around $ 5 million with $1 million per year and a long term commitment. This is extremely high for us. A sanctuary will also create job and decrease hunting. We need to reinforce rangers, for them to reinforce communities and protect animals. Here is Riquita, living since 16 years in a chicken cage who explains me she wants to be out. She is a chimpanzee and has feelings just like anyone else. Let's join forces in 2018 and break her and Joana's cages! Everyone deserves freedom!